3 identified graves and two others of note. Secondary Unit Text: transf. to (373493) 750th Coy. Additional information: Husband of Margaret Bond, of 105, Oakbank, Midcalder, Midlothian. Additional information: Son of James and Margaret Gifford, of Overton, Kirkliston, West Lothian. MOD EDIT: Armed Forces Memorial lists hims as COCHRAINE although the graves clearly states otherwise. Not listed on the Scottish National War Memorial. As a child I remember the airmen being moved to Cannock Chase, Staffs. Their death certificates were registered on the information of George J. McGregor, Clerk to Midlothian County Council on 30 March 1943. 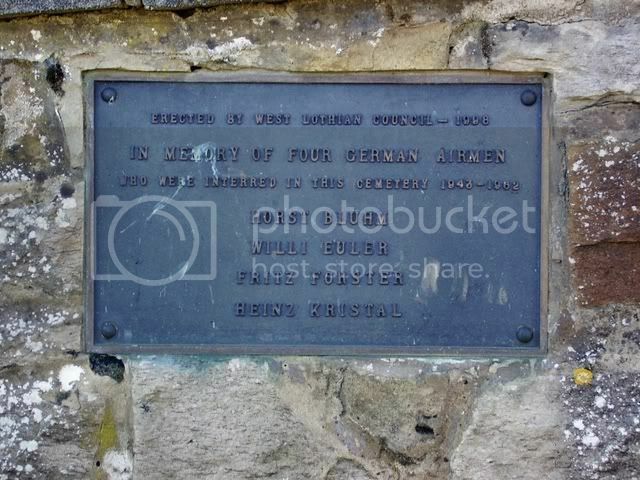 The air crash happened 25 March 1943. The Burial Records do not give a date of burial for any of the airmen. The Records also show different names, as information would have been limited at the time of death registration and/or burial. "Due to War Operations, (Multiple Injuries, caused by explosion after aircraft crash)". Unfortunately, I have been unable to source the death certificate of Willi Euler. Staff at Edinburgh Records couldn't find one either. He was buried in Lair 358A, Kirknewton Graveyard(Unknown written in the Burial Record with Willie Euler pencilled in). Interestingly, Robert Cochrane is buried in Lair 358, the same Lair as Heinz Kristall(Lair 358) and Willi Euler(Lair 358A) were buried. He was not killed in action. He was home on leave and died at an event during Kirknewton Gala Week. He is not commemorated on the Kirknewton War Memorial. On Tuesday of last week quite a gloom was cast over the village when it became known that one of its inhabitants, Mr Robert Bond, had met with a fatal accident by falling over the Tollbridge which spans a branch line of the Caledonian Railway near Cleland. 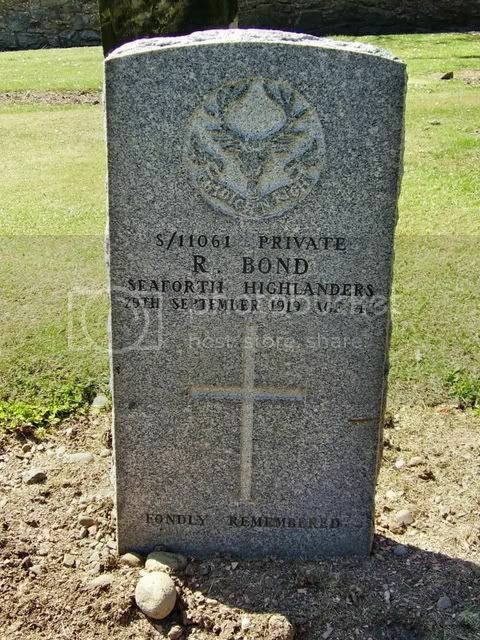 Mr Bond, who was an old soldier, having served with the Seaforth Highlanders, was on a visit to friends at Blackhill Farm, a short distance from the scene of the accident. He went out for a short walk before retiring for the night, and it is thought that owing to the night being extremely dark and not being well acquainted with the district, he must have stumbled and fallen over the bridge, which has a very low parapet, on to the railway beneath, a distance of fully ?0 feet. By the severe injuries he sustained death must have been instantaneous. 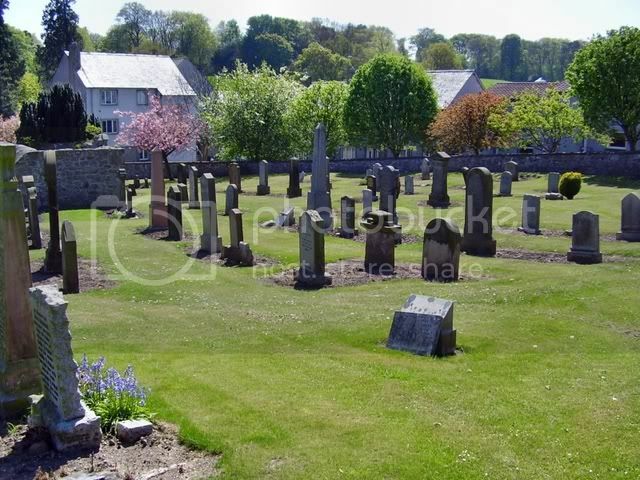 The last sad fact in connection with the accident was performed on Friday last, when the remains were laid to rest in Kirknewton Churchyard. Through the kind efforts of the secretary of the Discharged and Demobilised Soldiers' and Sailors' Federation, the funeral was partly of a military nature. A detachment of the 4th Edinburgh Garrison Artillery with gun team and carriage were present. A firing party from Bond's old regiment was prevented from attending owing to the railway strike. The coffin, wrapped in the Union Jack, was placed on the gun carriage, and amidst manifest signs of sorrow, was slowly borne to its last resting place, followed by relatives of the deceased, members of the Discharged and Demobilised Soldiers' and Sailors' Federation, and a large concourse of the general public. The Rev. Dr Gardiner officiated at the graveside and made fitting reference to the service Bond had rendered to his country during the South African and European Wars. Bond leaves a widow and large family to mourn his loss and to whom the utmost sympathy will be extended. Enlisted: Birmingham on 22 October 1915. Shows he had been in the Army Pay Corps 7 Nov 1914 and was discharged. He died four months after his discharge. Found dead about 8.00pm on 27 April 1917, 485 Cathedral Street, Glasgow. He was working as a clerk with a rubber tyre company. Cause of death was Pleurisy and Bronchitis. He was 22 years of age. 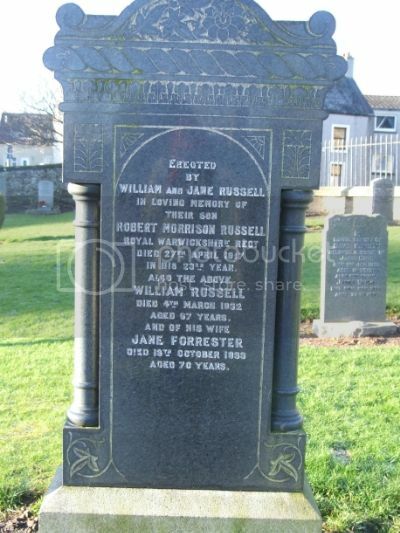 He was buried in Lair 264, Kirknewton Graveyard. Additional Information: Son of Mrs. Jessie Ballantyne, of Springfield, East Calder. Midlothian. Attested 20 November 1915. Reported wounded and missing 23 July 1916. Mrs Ballantyne, Bonnington Lodge, Kirknewton, has received official intimation that her son, Private Robert Ballantyne(3949), Royal Scots, has been reported wounded." 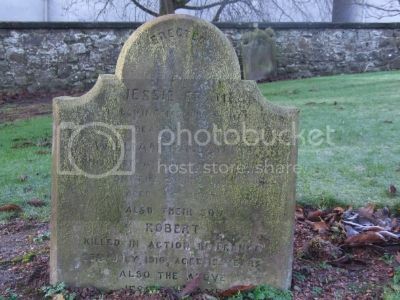 Robert Gifford, Private, 3rd Black Watch, died at the Military Hospital, Cromarty. His usual address was given as Nigg Camp, Nigg, the address of the Black Watch training camp. Cause of death was given as “ Cerebro Spinal Meningitis, 2 days”. 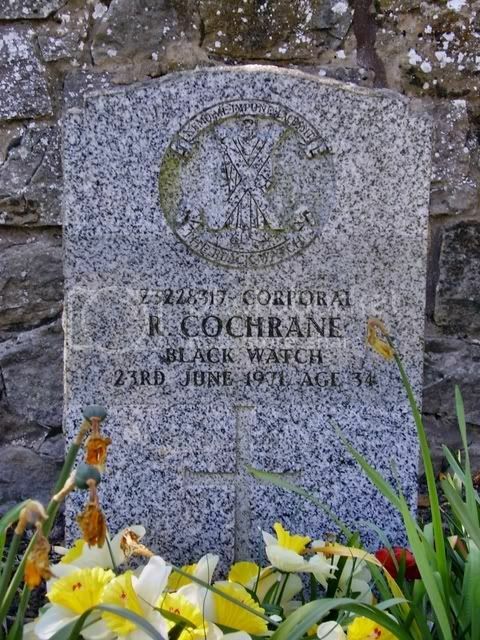 “Douglas Lawrence, L/Cpl 3rd Seaforths, attd R.A.M.C., Military Hospital Cromarty” was the informant and the death was registered “1917, July 2nd at Cromarty”. Pte. 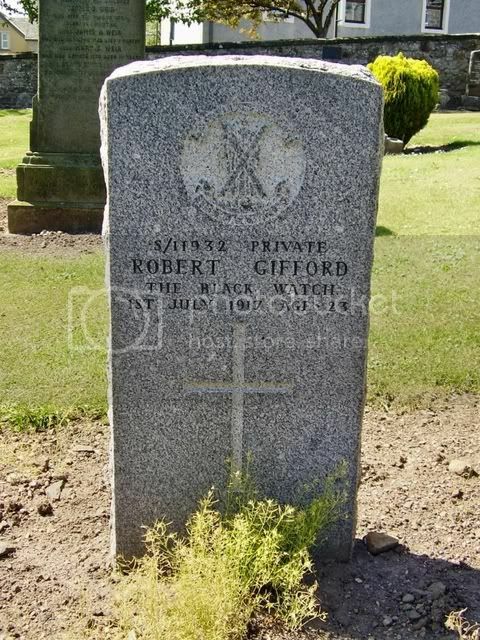 Robert Gifford was buried in Kirknewton Cemetery, Lair 298, and has a CWGC headstone. 1901 census showed him living with his parents, James and Margaret, and siblings at Haugh Farm Cottage, Kirkliston West Lothian.